Venezuela's recent experience is instructive. The Chavez regime had moved away from the fiat US dollar and had the bulk of its reserves in gold. Last month, Venezuela's reserves had been drawn down to about $19 bln, of which $14 bln was thought to be gold. Venezuela has found out the hard way that dollars are better than gold. At the end of last month, it swapped 1.4 mln troy ounces of gold for $1 bln with a large US bank. Venezuela's gold was discounted by a little more than 40% and it will pay interest on the dollars it receives. The swap is four years in duration, and at the end of it, Venezuela has the first right to buy the gold back. It is true that Venezuela has a relatively extreme macro economic situation. The IMF expects the economy to contract 7% this year after 4% contraction in 2014. Inflation is projected to be well over 100% and the fiscal deficit may be 20% of GDP. The black market rate for the bolivar has depreciated by nearly 50% so far this year. We suspect that when push comes to shove, and it will, Venezuela is more likely to officially devalue than default on its local debt. One of the advantages for Venezuela of the gold swap is that by some accounting it may still count the gold as part of its reserves. This underscores that central bank reserves may not always be what they seem. Central banks have used a number of ploys to hide the extent of their intervention, like operating in the forward market or conducting off-balance sheet operations, like Brazil's currency swaps. Similarly, Russia had included its sovereign wealth funds in its reserve calculations, but they are not liquid or available. The dollar's status as the primary reserve assets is partly a function the liquidity and depth of the US capital markets. Gold is not a particular liquid or deep market. Countries cannot service their debt with gold. To monetize it, Venezuela is paying a steep price--a 40% haircut plus interest on its dollar borrowings. This is not about the present or future price of gold. Venezuela's experience speaks to the use of monetary gold. To service one's debt and pay for imports, one needs paper money or claims thereof. About three quarters of the US reserves are in gold and almost 70% of German reserves are in gold. Greece and Portugal also hold a high proportion of reserves in gold. This says something about the low level of currency reserves as well as the gold holdings. 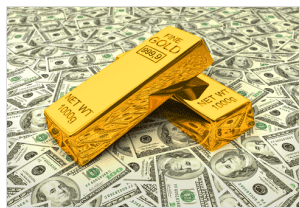 US gold reserves are worth around $800 bln. Portugal 's economy is about a tenth of the size of the UK, but it has about 70 tonnes more gold.